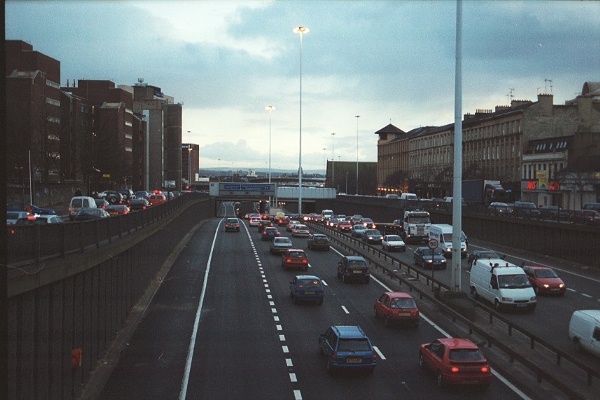 The A804 comes in from the south with one carriageway on either side of the motorway, goes around the NW side of the motorway and finishes leading to the east underneath the elevated motorway. Approaching J17 northbound. The single lane which joined at J18 stays segregated and will split off again at J17. 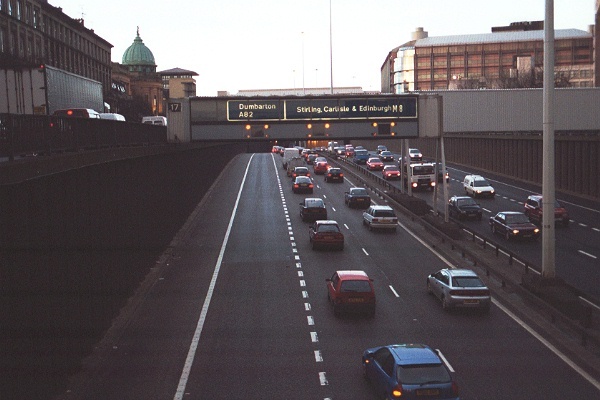 The yellow lights for the matrix displays are flashing, but with no other sign shown - this is most unusual, but is standard on the M8 when there's congestion over several miles. On quieter rural motorways, flashing yellow lights are used as a general warning of a hazard ahead, with a recommended speed of 30 mph, but a matrix would normally be showing the advisory speed limit. I suspect that an advisory 30 limit is a bit pointless when the average traffic speed is 10-15. 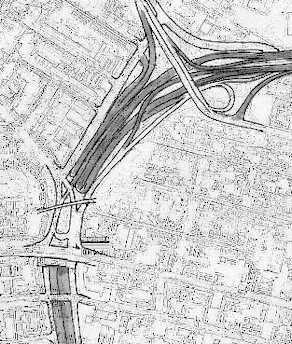 The marked hump in the motorway is due to yet another suburban rail line crossing underneath in a shallow tunnel. Looking south, the hump for the railway is even more pronounced. 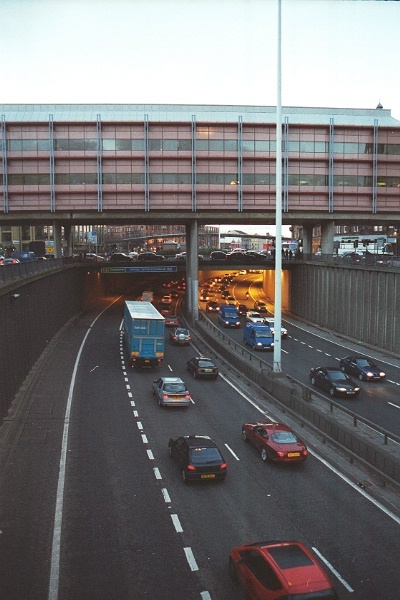 The southbound auxilliary lane only joined at J18 and leaves again at J19, so the lack of traffic is only to be expected. 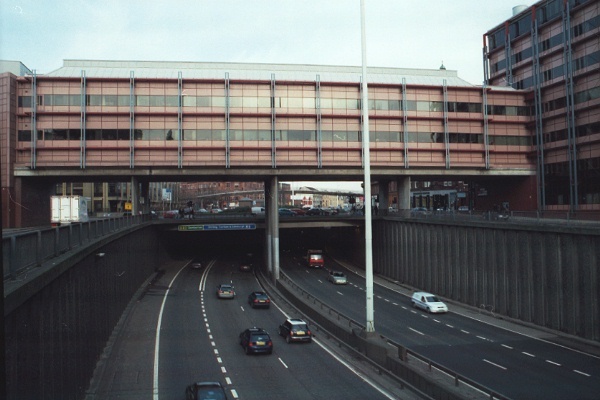 This office building is built right over the top of the motorway. 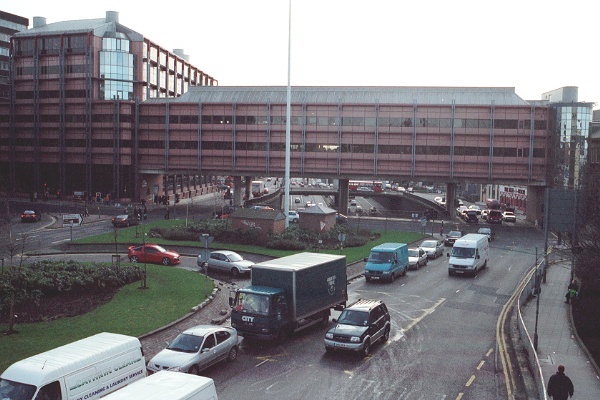 The bridge upon which it stands was built with the motorway in the early 1970s, but the office block was only added in the mid-1990s. 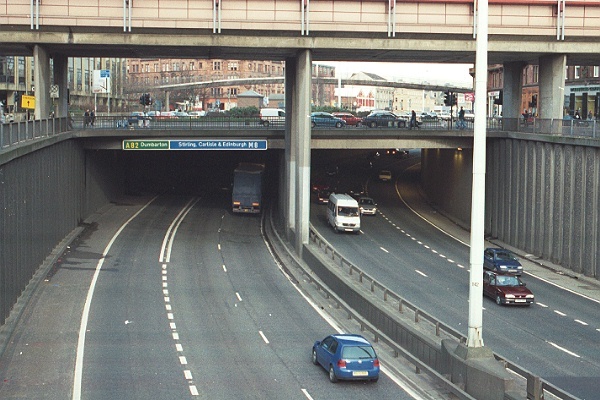 The St George's Cross Interchange includes a short section of 'cut and cover' tunnel. The split for J17 actually occurs just inside the tunnel. 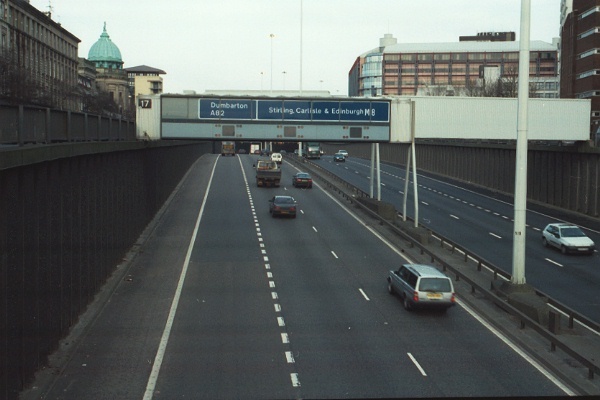 Note the unusual use of a green-backed sign on a motorway. The curve marks the transition from the north- south alignment between J17 and J19 to the east-west alignment. 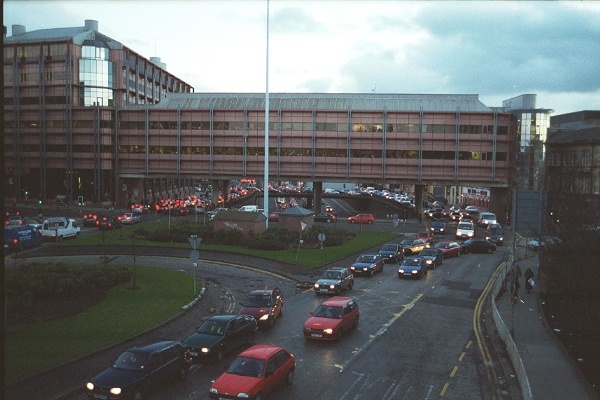 The ground above the tunnel has been landscaped, but the A804 traffic makes the green space inaccessible. ... and lunchtime traffic isn't that much better. 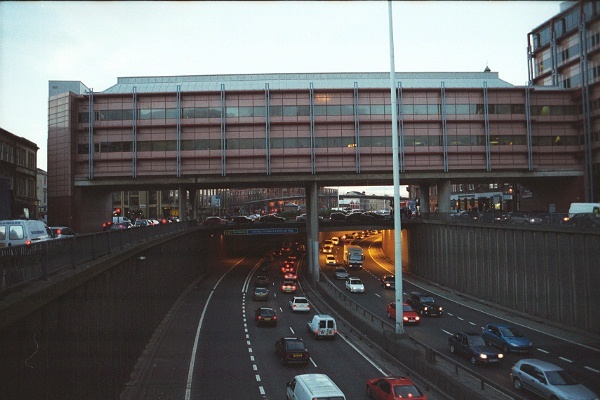 Looking south under the office building, the motorway can be seen climbing out to the south.